Nissan Skyline GT-R R34 converted from carbon as an addon car, meaning no other car gets replaced. - Increased top speed. See 3- down below. - Fixed issues with brakes clipping with rims. - Better matched vinyls with the car. Since original cars of the game have also parts not matching with each other I decided to not to try and fix, instead i made sure that the vinyls cover the car better. 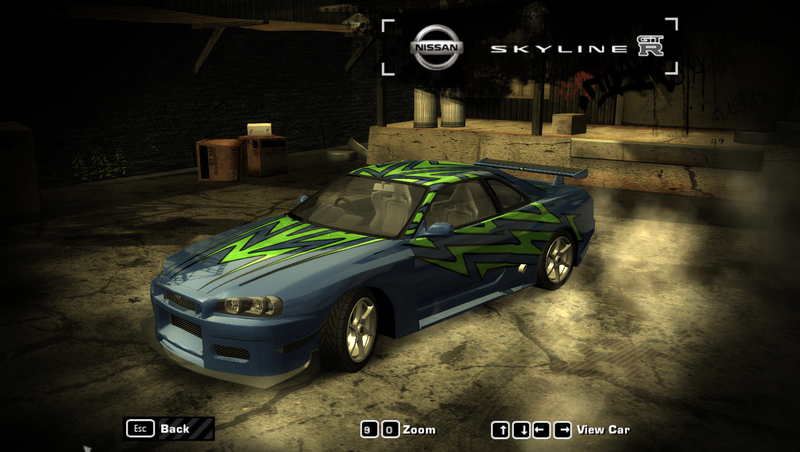 - Included modified SKYLINE 1024x Recompiled Vinyl by nlgzrgn. - Slight improvements to the meshes. 1- Copy the contents of "CARS" folder in the game installation folder. 2- With NFS-VltEd: File, Import -> ModScript. Select skyline.nfsms. - Tell me if there are issues. can you add damage (those scratches in the car)? can you add the license plate? to both the r34 and the 350?? and also the taillights in the skyline looks weird, besides that great job!! How come whenever I try to use this mod with the 350z mod the Skyline overwrites the 350z's slot too? Hey, if you add the dummies (mountpoints), mind adding just only 1 hood (the NFSU2 Tutorial one) if possible? Aside from that, amazing work.